The symbol was conceived in 1964 by the Singapore Tourism Board and is rooted in Singapore's history. The statue, designed by Fraser Brunner, measures 8.6 metres high and weighs 70 tons, built from cement fondue by the late Singapore craftsman, Lim Nang Seng. In ancient times, Singapore was called Temasek which in Javanese means sea. Temasek was later destroyed by invaders (Siamese or Javanese depends on source); A certain Prince Nila Utama of the Sri Vijaya empire (from where the island group Visayas in the Philippines was named), landed there and saw a strange beast, later identified as a lion, so he called the place Singapura (Sanskrit: singa=lion, pura=city). 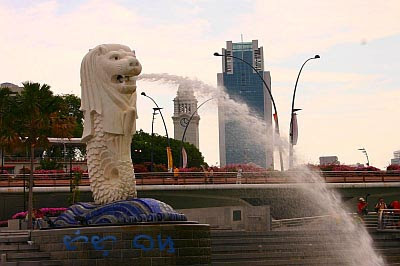 The Merlion, with its fish-like body riding the waves of the sea, symbolizes the ancient city of Temasek. At the same time, its majestic head recalls the legend of the re-discovery of Singapore by Prince Nila Utama, when Singapore received its present name. It's only in 1819 when Stamford Raffles arrived (not discovered) Singapore. He was accredited for also discovering the Rafflesia, largest flower in the world, named in his honor. The giant Rafflesia can be found in Borneo and certain parts of the Philippines: Mt. Banahaw/Makiling, Panay Island, and Davao. After this first Sleepless in Singapore night, the Tutubi was forced to don his business attire again attending the two-day conference. And the Merlion is such a wonderful symbol, in my opinion. My Malay friend gave me a beautiful Merlion key chain; a souvenir she bought when she visited Singapore on her way to Malaysia. It has an insert that tells the story of how the Merlion came about. Good informative post you have, Tutubi. Thanks for sharing. Paetechie, I am adel from bicol... working and studying part time. I had an idea of taking a stranger to our place, in exchange he/she has to take me in their place too... By the way, I am here in Manila, in case you love the idea, you can email me. God bless! kyels, such a symbol indeed. Pity those people at the Tourism department here. They've yet to create one for the Philippines. adel, that's what I also do with my friends. I toured them around Laguna. I'm planning a return trip to Daet, Camarines Norte too and targetting Calaguas Island this time. Already been to Daet in 2003.
wow! nice photos! singapore is such a very nice place. :) yung Merlion ba dito sa Pinas nag sspray rin ng tubig? hehe. curious lang. 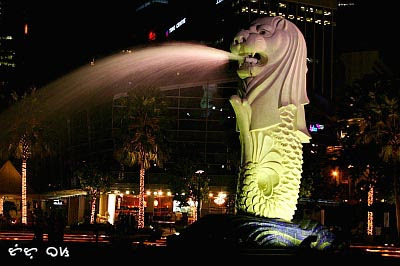 oo nga pala, what's the significance of the fountain of water from the merlion's mouth? may nabasa tuloy ako sa isang blog, the particular entry was about the time they went drinking somewhere near marina bay, they commented that the merlion itself had one drink too many! When we went to Singapore last year, we did not go to this Merlion fountain. We thought that the "Merlion" is the one in Sentosa Park. LOL. allanroyce, I'm aware of it. I have another post on this Manila Merlion history. hi question lang po..my family and i are planning to go to singa. just wanna ask if they will allow my daughter to go inside universal studio knowing she is only 2 years old? is there any fee? thank you so much..